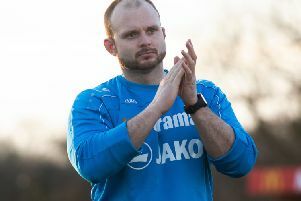 Positivity is the key for Hemel Hempstead Town against Bishop’s Stortford at Vauxhall Road on Saturday, according to Tudors manager Dean Brennan. The Tudors are still in with a chance of claiming the last Conference South playoff spot, but it is highly likely that they will need to win each of their three remaining league fixtures to give themselves a chance of finishing fifth. Hemel go into Saturday’s game on the back of an excellent 1-0 victory over playoff rivals Concord Rangers on Easter Monday, which followed a 1-1 draw with struggling Maidenhead United last Saturday. And Brennan is calling on the Hemel fans to get behind their team and cheer them on to victory against Hertfordshire neighbours Bishop’s Stortford. “The most important thing is that we need to have a positive vibe around the ground again,” said the Hemel boss. “There was some negativity last Saturday, and I can understand the frustrations, because the standards of the football club have gone through the roof since we’ve been here. “But people have got to remember, three years ago the club was in a relegation battle in the league below, and now we are competing for a promotion place in the league above. I’ve always said that the harder you work, the luckier you get and hopefully we can go and get the three points on Saturday. The Tudors know that nothing less than a win will be good enough against 17th-placed Bishop’s Stortford, although the visitors go into the game with recent victories against Basingstoke Town, Wealdstone, Bath City and St Albans City to their name. Brennan knows that his side’s opponents will be no pushovers, saying: “It’ll be a tough game, they are in good form – I think in the last eight games they’ve won four, drawn two and lost two and have beaten some good teams in doing that. “They are a young side with a very experienced manager so it will be a tough game. They have got a lot of pace out wide and we know what we are up against, it’s just about whether we can perform or not. “I think that if we can perform to the level that we did on Monday against Concord Rangers and the level we did in the second half against Chelmsford, then we will be tough to beat. “We have been inconsistent all season so it’s down to the players to answer that question – can they maintain the standards that they have set themselves? The state of the Vauxhall Road pitch has been a talking point all season, but Brennan is urging his side to forget about the playing surface on Saturday. “We’ve just got to get on with the pitch now and hopefully try and use it to our advantage,” he said. “We are quite a big side ourselves and we will play a very attacking style again on Saturday. We will have a right go at it. “The one thing that I can guarantee is that the players will work their socks off because they’ve never let me down in the work ethic department; they’ve never let themselves down or their families down because they have worked so hard this season. The Tudors go into the game with no suspensions – Eddie Oshodi and skipper Jordan Parkes will be banned for the last day visit of Eastbourne Borough after being sent off against Concord Rangers. David King misses Saturday’s game through an injury picked up against Maidenhead United, and Ed Asafu-Adjaye remains a doubt.